emblem on the front you can get one at our SOS online store: Click Here They may be out of 2014 stock right now but will be restocking soon for 2015. Keep checking. As you continue this series I need to remind you that I have an Android tablet with 4.4 os and I was unable to get the videos to play. However, I was able to play them on my laptop PC. "Dad is working so hard! He's walking with a tripod cane & a brace for his R leg with minimal assistance, transfers with minimal assistance, continues to eat well & is progressing with his speech & language. All very positive signs!" "Dad may get tired of his PT daughter the next few months! So proud of him. Look at him go today!" 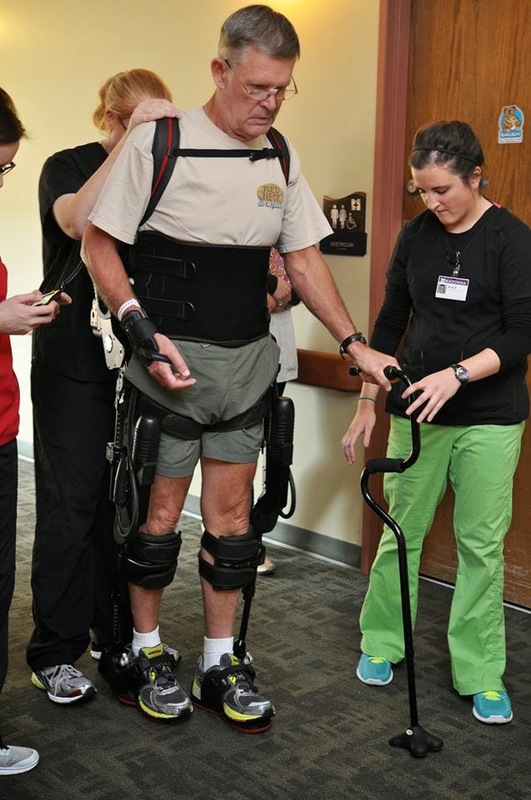 "Dad in the EKSO (robotic walking device) today! So fortunate to have access to the amazing technology & highly skilled clinicians at Madonna. Thanks for all you are doing for Dad! "Lots of 'firsts' again today! Dad had his first body weight support treadmill session in the morning & then went home to Wahoo this afternoon for a home visit with the OT who specializes in home assessments & can make recommendations for any modifications or equipment that may be needed to enable dad to be as independent as possible at home. 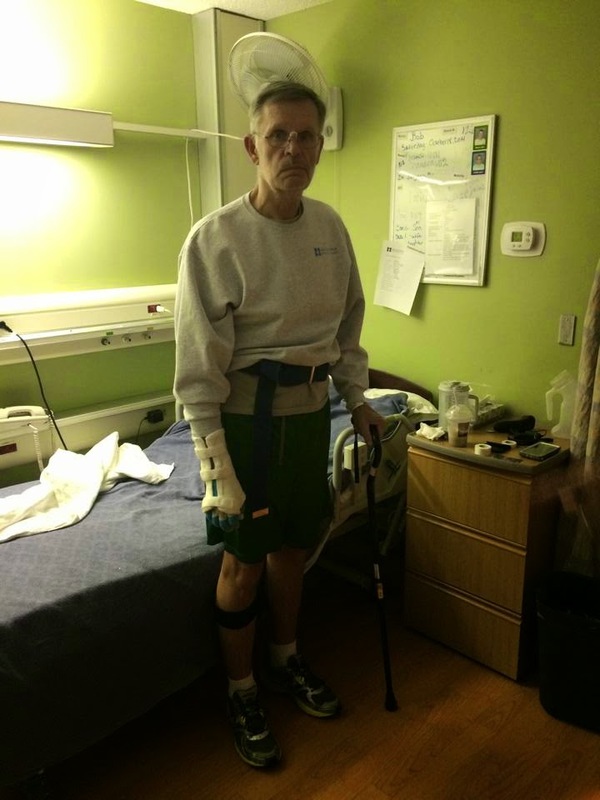 We found out this week after only 2 weeks of acute rehab dad may be doing "too well" in the eyes of the insurance reviewers so he may have to be prepared to transition home sooner than expected which puts a lot of stress & worry on mom & dad. He will continue with therapy several times per week at Madonna in the Rehab Day Program. Please continue to pray we are able to get at least another week or two of intense inpatient rehab at Madonna. Dad is in a very critical window right now for brain reorganization & recovery & the research shows the more intense therapy is now the better the outcome. Why don't insurance companies see more than the bottom line?" 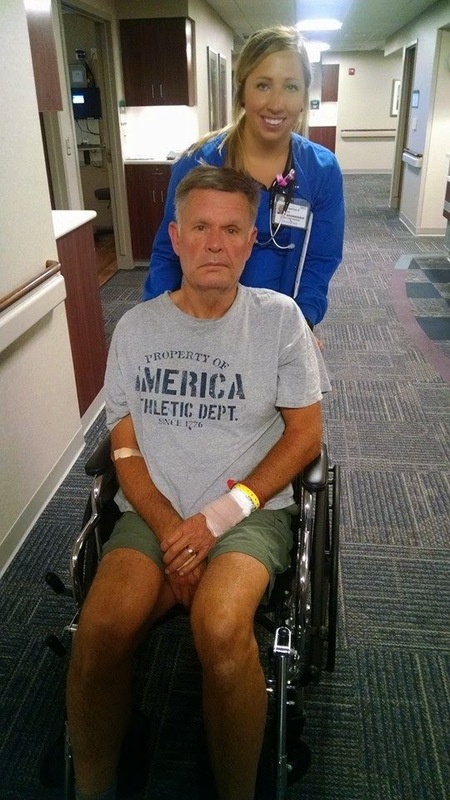 "Dad had a follow up visit with the vascular surgeon today to see if he will be able to do surgery on the right carotid artery that is approx 90% blocked to restore blood flow to the brain. Unfortunately, he told dad the left middle cerebral artery is still 100% occluded (blocked) & that is the main blood supply to the motor cortex portion of the brain that controls right hand & arm function so he will most likely not regain full (functional) use of his right arm. Needless to say this was very hard for dad to hear & he is real discouraged now. A carotid endarterectomy surgery is scheduled for the morning of Nov 4th. I'm so scared he's going to give up. I wish I could make his arm move more. He is so fortunate to be doing as well as he is. It could have been so much worse, but to dad it's the worst it could be. My expertise & experience tells me to keep the faith & remain hopeful as we know so much more today than we did even 5-10 years ago about how the brain repairs and reorganizes itself with continued therapy & practice. Please continue to pray for my dad & family. Thank you!!" 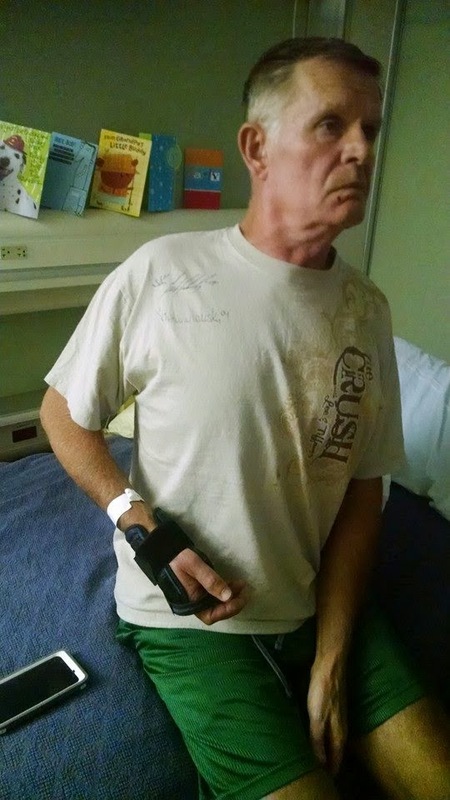 "Dad had a better day today thanks to the amazing therapists & technology at Madonna. I can't imagine how hard this is for you, but you have come so far & you will keep getting better. Way to go! Just one more...he even did it with a cane! So proud of you dad!" "…he cried tears of joy today. God is good!" 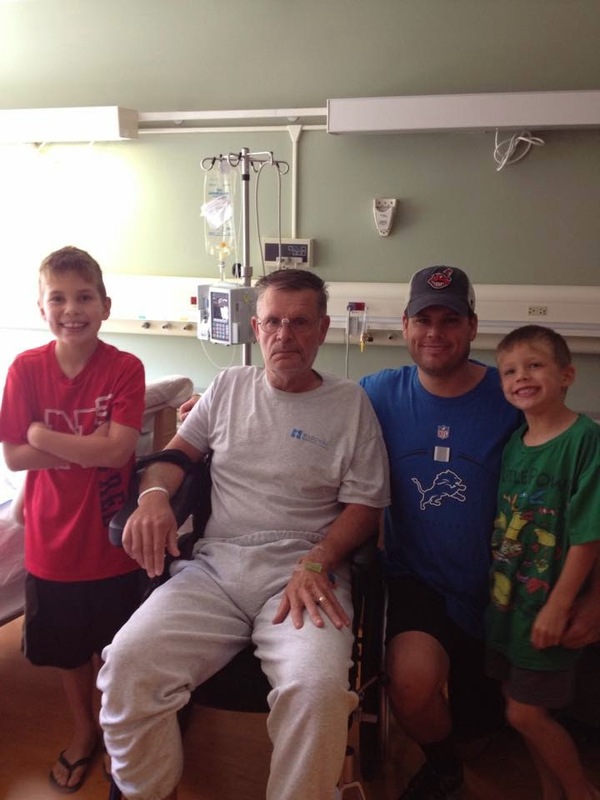 "My family and I are so grateful for the top notch care dad has received at Madonna. There are so many hidden blessings that have come & will continue to come out of this difficult situation. Thanks to all our family, friends & Madonna family for your ongoing support & prayers." "Dad is moving his arm!!!! So proud of his hard work & determination. God is good!" This is progress! However, as you saw October 20, he is still facing some surgery. Come back next week to see the rest of Bob's story. logo on the front you can get one at our SOS online store: Click Here They may be out of 2014 stock right now but will be restocking soon for 2015. Keep checking. Before you begin this series I need to inform you that I have an Android tablet with 4.4 os and I was unable to get the videos to play. However, I was able to play them on my laptop PC. 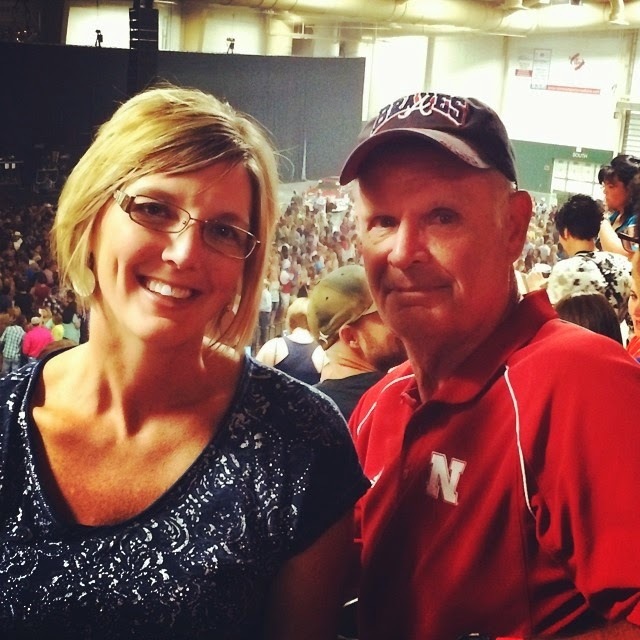 Editor's Comment: On September 22, 2014, Amy's dad, Bob, had a stroke due to blood clots in major arteries. The following timeline traces his recovery progress, courage, and resolve through his daughter's eyes from July 24, 2014 through February 5, 2015. 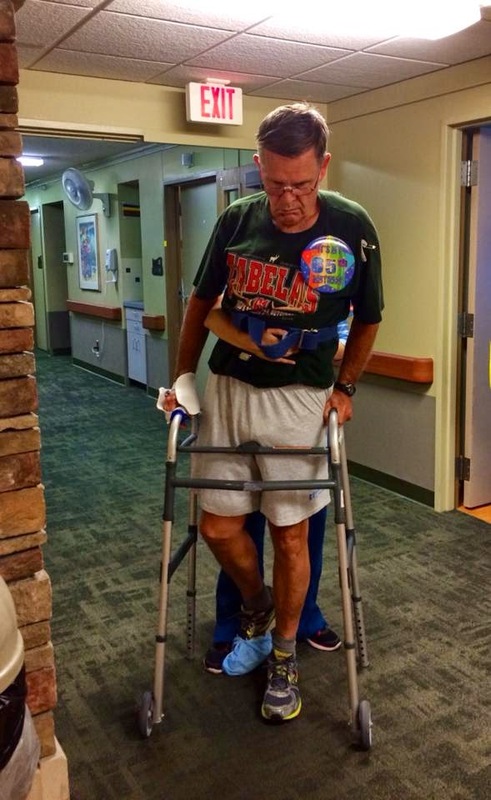 It will take you from where he is barely able to move to where he is walking on his own without a cane. A remarkable journey. Amy is a Stroke Program Manager and Physical Therapist at Madonna Rehabilitation Hospital in Lincoln, Nebraska and is a Retreat & Refresh Stroke Camp volunteer at the RRSC camps near Lincoln, Nebraska. "Well my dad is showing how determined he is this morning. He sat up, stood & walked to the sink to brush his teeth & then to the bathroom with a wheeled walker & assistance. Next step on to Madonna later today hopefully to continue his rehab journey! God is good! Keep the prayers coming. Dad can feel them helping. The OT is great! I know her personally & when dad started to take steps she just said "ok let's go Bob" & helped him walk to the sink! It was awesome! He's so determined! He has maybe trace grasp at times...he has some increased tone we noticed today. He is moving his right leg more today too." "Madonna is starting to work miracles! Bob has been moved to room 126." Way to go Dad!!! We love you." 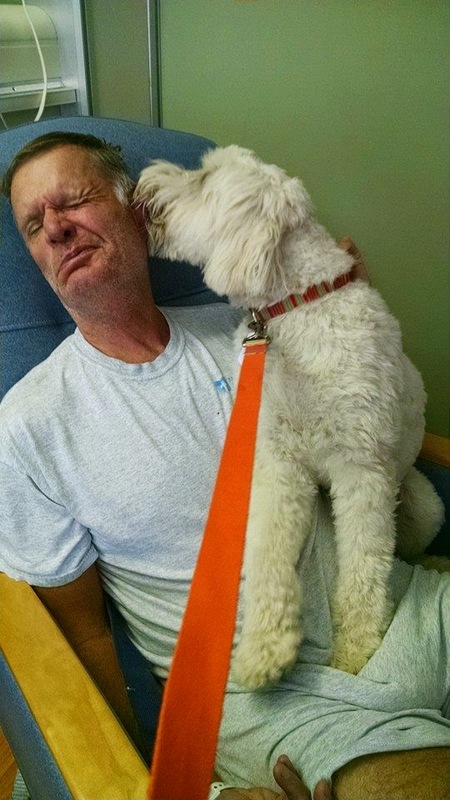 "Bob is now receiving very aggressive therapies that consume most of his mornings and afternoons. I am also encouraged to attend. Visitors are welcome after 6:30 pm. Room 126". "He had a special visitor today!" "We all went up to see Bob this afternoon! He's looking so good! So proud of him!" "Happy 65th birthday Dad! We have so much to be thankful for & celebrate today. Dad is making great progress in all his therapies. What a difference a week can make. His brother Russ came to visit. Tonight we brought in Valentino's pizza & pasta and had cake for his birthday. We're so proud of you Dad! Keep up the good work." "So many emotions this past week...my dad had a stroke, I volunteered at Stroke Camp in Ashland & today I was honored to attend the 20th annual Madonna Goal Awards where we celebrated the amazing stories of patients who overcame so many challenges on their journeys back to independence. I sat there thinking back on all my family & I have been through this week & felt a sense of peace knowing my dad WILL get better thanks to the amazing staff & technology only available at the place where miracles happen every day & I am blessed to get to work, Madonna Rehabilitation Hospital. Thanks also to all the stroke survivors & caregivers who attended Stroke Camp last weekend & once again reminded me how important it is to raise awareness & continue to pursue treatments & technologies to help those living with stroke. You all are truly amazing & inspiring!" Editor's Note: Please check back next week to see where Amy takes us as Bob goes from here to further recovery. logo on the front you can get one at our SOS online store: Click Here. They may be out of 2014 stock right now but will be restocking soon for 2015. Keep checking. Editor's Note: As many of you know by now, I very rarely plug products on this blog. However, this book by Anne Burleigh Jacobs comes very highly recommended by our own Executive Director, Marylee Nunley, who's husband is a stroke survivor. If you wish to get in touch with Marylee to get her opinion on this book, you can reach her at info@strokecamp.org. Not only is Anne a great writer but she is also a stroke camp volunteer. She attended our first camp of 2015 in La Jolla, California last month. So, I welcome Anne to our family, and I will be posting some of her material in the near future. She also maintains a blog, https://authoranneburleighjacobs.wordpress.com. If you like her work or have any questions for her you may contact her at: abjacobs@sensomotor.com. "I had the pleasure of attending Stroke Camp last week in La Jolla California. I can honestly say that I gained so much more than I gave! It was a weekend of laughter and camaraderie ~ a weekend of sharing and supporting ~ a weekend of gaining strength from each other. I met some amazing people and have so much respect for the stroke survivors and their loved ones who live each day with the struggles of stroke, and yet they turn those struggles into moments of inspiration and strength. As anyone there can attest, I cry very easily. Sometimes I tell people that I have “dry eye” and that the lubricating tears are just a side effect of the disorder. Not true. I just cry easily. My daughter says it is because my heart sometimes brims over as tears. At stroke camp, I did not cry tears of sadness. Instead they were tears of release, of celebration for the strength of the human spirit. Every day we hear about the pain and suffering and cruelty of our world. What I experienced was only love and respect. That is what we need to be shouting from the mountain tops. Not our differences, but our similarities ~ as people. From that we gain strength. 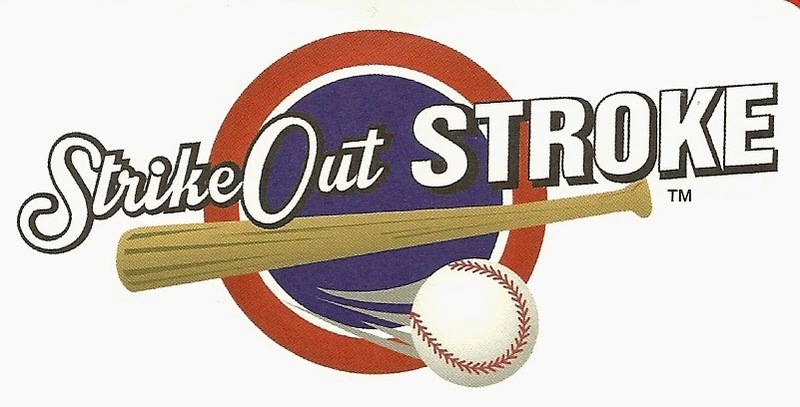 Cheers to the Entire Team from “Stroke Camp”. You are everyday heroes !" Stockton, CA – With decades of experience in neuroplasticity and emerging medical technologies, Anne Burleigh Jacobs, PT, PhD is convinced that better assisting stroke survivors begins with a change in attitude from the medical community. Jacobs new book, “Highs, Lows, and Plateaus: a path to recovery from stroke” is an easy-to-understand guide to recovery after a stroke or brain injury. It challenges health care professionals who concentrate on helping patients to cope rather than understand their condition and explores breakthrough treatment options. Topics discussed include but are not limited to warning signs of a stroke, emergency treatment of a stroke, potential of the brain and nervous system to reorganize and recover and lastly a variety of treatment techniques as well as mechanical, robotic, and bionic tools that Jacobs believes are the future of rehabilitation. Anne Burleigh Jacobs, PT, PhD earned her doctorate in Neuroscience and Physiology from the Oregon Health Sciences University in1995.Dr. 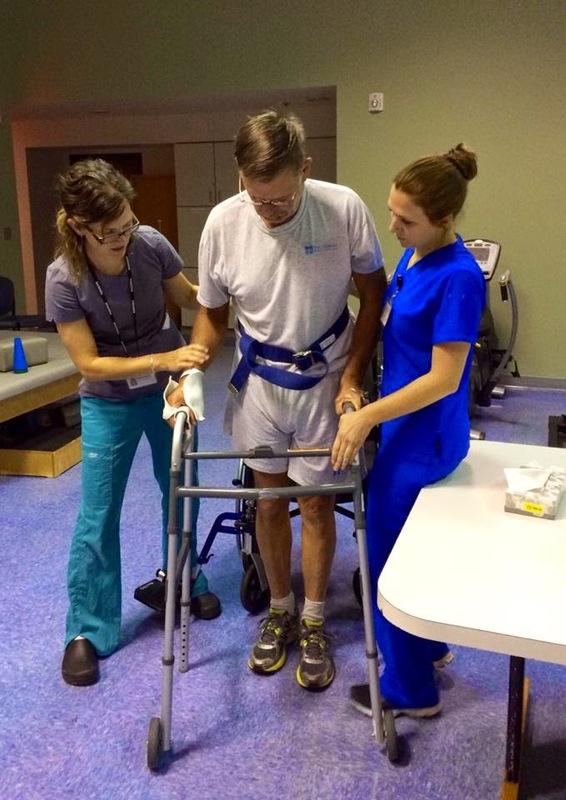 Jacobs' research and clinical interests over the past 25 years have focused on the role of sensory and motor interactions for recovery of standing balance, ambulation, and reaching movements post neurological injury. Dr. Jacobs was a co-founder of the Peninsula Stroke Association (now Pacific Stroke Association) a non-profit organization dedicated to stroke prevention, support and advocacy. Currently, she specializes in post-stroke recovery through her private practice. Dr. Jacobs has lectured nationally and internationally on topics related to neuroscience, recovery of sensory-motor function, and motor learning. We sometimes think that strokes only happen to the elderly or the infirmmed but here is a healthy young boy who had his stroke when he was only eight years old. The following was adapted from the Retreat & Refresh Stroke Camp FaceBook page dated January 20th, 10am CDT. Every year I have the opportunity to invite one guest to the State of the Union. This year, I invited a 12-year-old boy named Jackson Cunningham because he's my personal hero. "I want it all back." It all started with a basketball game at Jackson's school. He was going to spend the day at his grandparents afterwards. While playing outside he didn't feel well. He went inside and got sick. He lost control of his left side and was taken to the hospital. Tests were run with no results. Jackson's pediatrician came to the hospital and immediately had him moved to another hospital. There the life altering news was delivered - Jackson had a stroke. Half of Jackson's skull was removed during surgery, but he was undeterred. A doctor asked Jackson what he wanted to get out of therapy. His answer was "I want it all back." After months of intensive rehab, Jackson was able to return to school the next fall and start 4th grade with his classmates. "Do not give up on yourself. All the hard work is worth it." My name is Jackson Cunningham. I live in Oakwood, Illinois and I am nine years old. had two surgeries before I got to leave the hospital. helped. All the therapy paid off . One of my teachers at RIC knew I liked the Coast Guard. She set up a boat ride for me. It was on a Coast Guard boat on Lake Michigan. It was cold but I had an amazing view of Chicago. When I was at RIC, President Obama was just outside my window in his car. He got out of the car and my dad could see him. We found some good pizza places in Chicago like Gino's East, Giordano's and Lou Malnati’s. I stayed at RIC for a month. I got home on April 19th. I still had to do therapy at Carle,which is in Champaign, Illinois. I also had a tutor who came to my house and worked on school work with me. - she never shuts up!). But, I am working on memory and attention. I do FastForward on the computer to help my brain. Last week I was in a basketball game at my school. It was the teachers against the kids. We outsmarted them! I hope I will be able to play sports again, like I did before the stroke. lots of things back fast. P.S. Kids Rights! I think kids should get paid to go to school. We appear to have a lot in common. Like you, I was born in Champaign IL (about 45years beforeyou! ), we both have survived a stroke and have an appreciation for the RIC and it's people. Your letter was one of the best of many I received. I appreciate your positive thoughts. Your experience provided me inspiration that with the RIC's help a person can recover from a stroke! As a North sider I would have to consider myself a cubs fan but also enjoyed watching the 2011World Series Championship Cardinals!! I agree with many of the political views that you expressed in you last letter to me, such as that kids should be paid to go to school. I think of you often because of your letters you have written to me. I look forward to receiving your next letter and hearing about your trip to Chicago and the legos you purchased with your birthday money!! I would like to close with some words of encouragement that my mother used to always says "socks up little cabbage" - which is another way of saying "keep your spirits up!" My first week of camp was very hard. I got to do karate and I made space gak. I've been improving a lot. I hope you're getting better too. Maybe I will see you in Chicago before camp is over. I've been eating my meals with my left hand. I have to put on my cast when I get up in the morning until I go to bed! My mom is going to send you a picture of me petting a baby chicken at my nana's farm. I too have met Georgia the therapy dog many times at the RIC. She is absolutely adorable. Whenever there was an extra empty bed in my room Georgia would find a way to use it. Georgia has one main trick: When her owner Ellen tells her to "VISIT" Georgia puts her head on your bed so you can pat her. She has such big brown eyes that it would just melt your heart. I'm very happy to find out about how camp turned out for you especially since you had to wear that awful cast. The people at the RIC surely know a lot about how to put you back together. I know that cast presents difficulties and I am sorry for that. I'm glad you like Legos. They were one of my favorite things when I was a kid. Tell your Dad that my favorite thing to eat these days is the granola bars like the kind your Dad makes. This part is to Ann: After my experience at the RIC I know how vital Rehab is after a stroke. I honestly didn't know this until I personally experienced it. One of the most inspirational people I met in the RIC was a speech therapist named Katherine Borio. So Ann, I thank you so much for your work with Jackson. It is so important. Recently I had the opportunity to meet Dr. Betts who founded the RIC in Chicago. In two weeks I am looking forward to meeting a man named Mark Stephan who is riding his bike 3129 miles across America. He has a web site so you can look him up, but Jackson don't start riding your bike across America without asking your Mom. I'm sure Mark Stephan already checked with his Mom. Keep working Jackson!!! Make sure you do everything your PTs and OTs say! I'm thinking of you and your sister Jordyn. Ann and I started to write you a letter yesterday and she had to take a phone call. So, guess what I did? I started to type the letter myself, using our Brainstorming notes. Some of the keys on the computer did not have the letters written on them, but I still figured it out. Ann is sending you that letter too. I had a fun weekend in Chicago last weekend. We went to a hotel to spend a couple of nights on the anniversary of my stroke. It’s been two years now. We went to Shedd Aquarium, to the Lego story, swam a lot at the hotel and eating only at new restaurants. That was my dad’s rule. That was OK, but I didn’t agree with some things we were eating. He wanted us to go to a Chinese restaurant but I didn’t want to. I liked some of the breakfast places like The Original Pancake House and one good barbeque place. I was happy that I had NO appointments! My uncle got an A on his Chemistry test in college. I got a B on my math test and an A+ on a Spelling test. Illinois’s basketball team is doing very good. They beat Indiana, who is number 1 in the country. And Illinois made the Purdue coach so mad they had to take him out of the game. Do you watch any of the Illinois games? How is Washington? Are you still getting therapy there? Where do you live? Are you coming back to Chicago soon? Where is Cleopatra staying? My new dog, Paisley, is very smart. She can open the door by herself and get in to my bedroom. She uses her paws as hands to move things on the counter. She lost two puppy teeth. We found them on the floor and on the bed. My mom’s cat, Sabey, died. He lived 11 years – longer than me. Maybe we will get another cat or a new dog from the same breeder. I got the letter you typed yourself, I’m very proud of your progress keep it up! I am very sad to hear about your loss of Sabey I hope that zombies didn't get her and I'm sure you defended her well. I am writing you this letter from my office in Washington I am very happy to be back at work where I should be, working for all 12.6 million people in the State of IL (that includes you Mister). 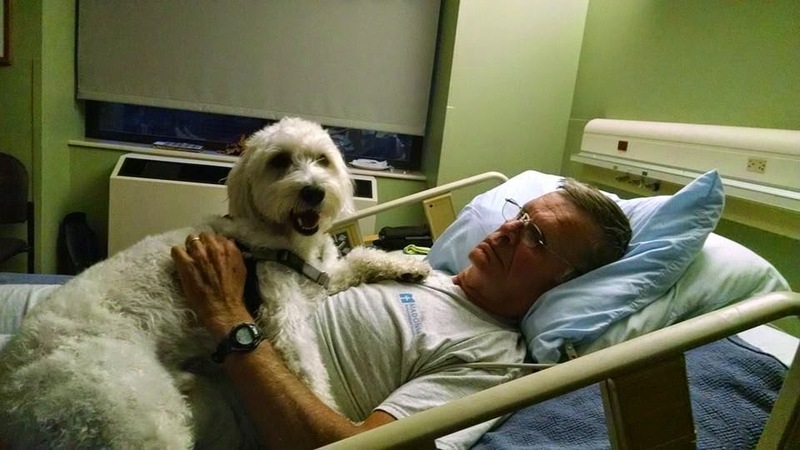 I recently visited wounded soldiers at the Bethesda Naval Hospital. One of them is planning to do the Bataan March, which is an 11 mile walk—impressive because the patient I talked to had only one working foot. I'll be back in IL in April. Cleopatra is currently destroying my sister's apartment in Evanston, bit by bit. I've got a good supply of granola bars here at my office; I hope they were made while your dad was at work. Keep your letters coming. Now 12, Jackson's rehab has paid off also. I am inspired daily by his perseverance. Each step he takes is a reminder of the everyday heroes I am fighting for in Washington. I am honored to count Jackson among my friends and have him as my guest at the State of the Union. I hope his visit will show him and other stroke survivors that having a stroke doesn't have to limit your potential. Stroke is the leading cause of disability for adults in the United States, but it shouldn't mean the end to a productive life. Survivors deserve better. It is my mission to create a standard of care to optimize the entire rehabilitation system—by transforming the way researchers, doctors, therapists and hospitals care for patients with neurological disorders and injuries—to give others the opportunity to have the absolute best quality of care possible. Since our initial letters, Jackson came to visit me on Capitol Hill, I raced Jackson at University of Illinois, and we climbed the Willis Tower together in Chicago. To learn more about Senator Mark Kirk's work on behalf of stroke victims, please click here.